Pencil and his boy Jackson are a great pair: they draw, they sketch, they scribble. But then Jackson gets Tablet and Pencil finds himself dumped in the dreaded junk drawer; he just can't compete with Tablet's videos, games, and movies. How will Pencil ever reclaim Jackson's attention? With the help of some new pun-loving junk-drawer friends (and a drooling, pencil-chomping dog), Pencil sketches out a plan to draw Jackson back into their friendship. A former educator whose first book was shortlisted for a Crystal Kite award, author Ann Ingalls uses kid-friendly puns and an upbeat tone in this story that celebrates friendship, collaboration, and unplugged fun. 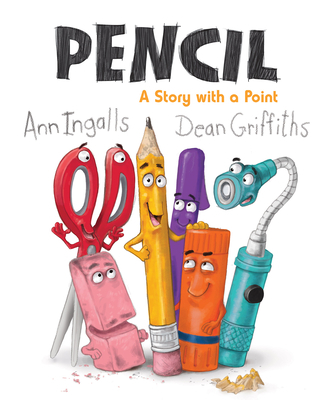 Buoyed by award-winning artist Dean Griffith's always-exuberant illustrations, Pencil: A Story with a Point is a gentle reminder that technology is no match for imagination.